Aligns big toe to correct position and reduces pressure on the joint. Gently stretches muscles and tendons to help slow condition progression. Thin, flexible design fits in most roomy footwear. 1 per pack. Release thin band from button. Open wide band by releasing Velcro® attachment. Place nylon cap over big toe. White cushion goes over the bunion. 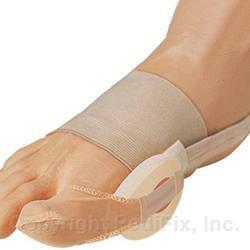 Place wide band around the middle of the foot with Velcro pieces on the bottom. Adjust Velcro (on middle band) to fit so band is snug around the arch. Button will be on outside of foot. Pull thin elastic strap around back of heel, adjust to straighten the toe. Reattach strap to the button. Product should fi t snugly but should not be too tight. Once everything is adjusted, trim excess material from thin band or Velcro if needed.